Like most any trip of ours that involves driving through Southern Connecticut, if the timing allows, we usually stop in New Haven for Pizza. For those people that aren’t familiar with it, New Haven Pizza (often known in the area as “apizza”, pronounced somewhat like “a-beets”) is practically a religion, with several establishments having turned out this style of pizza for almost a century now: chewy crusty, heavy charring, crushed tomato sauce, and relatively light cheese. It’s actually my favorite overall style of pizza, and it’s almost impossible to have a discussion of the style without an argument about which of the two iconic New Haven pizza places: Frank Pepe’s or Sally’s Apizza, is the best. I was brought up in the Pepe’s faith (there really wasn’t much question about it, if you had asked about Sally’s, it was like asking your Protestant parents if you could go to the Methodist church…), but do appreciate a Sally’s pie every once in a while. But somewhat lost in the noise in this argument is the fact that there are actually several more excellent places in the pantheon of New Haven Apizza other than Pepe’s or Sally’s, indeed, I can easily think of another half dozen good places to go (and even more that used to be around, like Bimonte’s in Hamden). But if there’s one perennial also-ran in the race for best Apizza, it’s one of the most venerable as well: Modern Apizza. 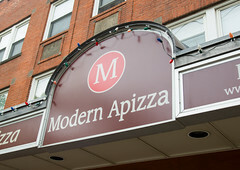 Located on State Street on the opposite side of town from the Wooster St of Pepe’s and Sally’s, Modern Apizza is a similar pizza joint: a small, narrow storefront built around a large pizza oven, eventually expanding at some point into next door, with booths lined up and down the walls of the restaurant. They’ve been here almost as long, too, having opened 10 years after Pepe’s. There are a few differences: Unlike Pepe’s open-air kitchen, the dining area at Modern is separate from the kitchen (although it’s easy to get a good view of their impressive brick oven). And unlike Pepe’s or Sally’s, the brick oven at Modern got converted at some point to be gas-fired instead of coal-fired. But in general, it’s still quite the time capsule (indeed, they’ve still got a vintage menu up on the wall). There’s another important point for travelers such as myself: while the line to Pepe’s or Sally’s can often be much like an overnight wait for concert tickets or the next Star Wars film premiere (really, I have spent 4 hours in line at Pepe’s before), there’s usually not much of a line, if any, at Modern. Indeed, I don’t remember the last time I had to wait more than five minutes for a table. But enough of all the background… What about the pizza? Well, after getting promptly seated, we ordered up my standard New Haven-area pizza: Mozzarella (another distinction of New Haven apizza is that for the old school places, cheese isn’t automatically a topping) with sausage and mushrooms. And, about 20 minutes later, our pizza arrived. 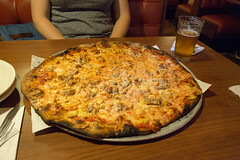 New Haven pizza isn’t the most photogenic, but what makes it look a bit dingy is what’s really giving it some great flavor: a really nicely charred crust. A great pizza starts with a great crust, and despite the non-use of coal, Modern has a thoroughly good crust going on: chewy, flavorful, and thoroughly roasted top and bottom. Add on a sauce that doesn’t completely overwhelm the great crust, some excellent Italian sauce crisped up nicely in the oven, some mushrooms, and some aged mozzarella that’s just starting to crisp as well, and this is a thoroughly enjoyable and competent version of a New Haven Apizza. I still give an edge to Sally’s and Pepe’s (to name two), but this is still top-tier pizza. Overall? Modern Apizza gets a lot of my traffic. If I’m lucky enough to be swinging through during an unusually light time (like 4pm on a Thursday), Pepe’s usually gets the nod for me (and a reminder to myself, I still need to actually write up Pepe’s), but otherwise, it’s Modern. As I tell a lot of other people, you get at least 90% as good a pizza at Modern, with less than 20% as much drama. And hey, they’ve got Foxon Park sodas on tap as well. Modern is definitely a winner. Bimonte’s was in Hamden, never North Haven. There is still a Mr Bimonte’s, fka Mr B’s fka Bimonte’s North, in Cheshire CT but it isn’t the same. There are two very good pizza joints owned by former longtime Bimonte’s pizzamen. Si Mangia in.Hamden and Rossini’s in Cheshire. Doh! I meant “Hamden” (Whitney Ave, right? Been a long time). I know a lot of the former Bimonte’s folks are still around… I have to check out Si Mangia and Rossini’s at some point. Still need to come down for pizza and beers with you at some point. Since when are Methodists not protestant? In late August I had a business trip that included a stop in Arlington, Virginia. From roughly 1991 through earlier this year, my brother used to live in the DC area, so I’ve been coming to various Arlington and DC destinations for quite a long time. Indeed, I’ve long been a fan of several of the Arlington Vietnamese joints. Pho 75 has long been a favorite, and the Clarendon area used to be chock-a-block with little Vietnamese restaurants. Alas, times change, and many of the Clarendon Vietnamese places have been turned into parking lots, apartment buildings, or parking lots turned into apartment buildings.